Working with an experienced personal trainer will help you to gain the maximum benefit possible from your available amount of time to exercise. Instead of going to a gym and guessing the best way to exercise, your personal trainer will lead you through a training plan based on your goals and current fitness level. Your diet and lifestyle can also help or hinder your chances of reaching your goals. Charlie takes the time to get to know each client well, and is able to offer advice that maximises results and improves well being. Dedicated one-to-one sessions to help you achieve your goals. 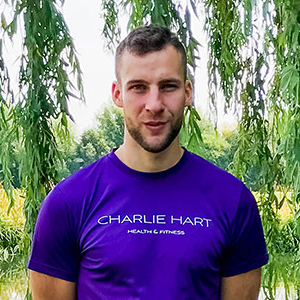 Personal training with Charlie combines his expertise in weights, martial arts, flexibility and aerobic cardiovascular training. Whilst three sessions per week is ideal, we understand the demands of day-to-day life. Book from one session per week to begin seeing an improvement in your health, body and well being. It’s often easier to get fit if you do it with a partner or friend. It’s also a great way to make personal training more affordable. Charlie regularly works with teams or small groups. Adding that competitive element can really help to push you harder. Diet advice and lifestyle changes are much easier to implement if you are doing it with your partner. Helping desk bound workaholics is one of our specialities. Fix your posture and improve your health. Sleep better, feel better, work harder. Getting ready for that dress? We’ve worked with lots of brides to help them feel confident and happy on their special day. Tone up, lose some fat, eat better. Is back, neck or joint pain holding you back? A regular training regime can fix your posture, pain and improve your long-term health. Losing weight isn’t all about the scales. We work with clients to tone up, reduce body fat and change habits for life. The opposite of a short-term diet. We train in the beautiful surroundings of Buckden Marina at the Waterside Leisure club. Based in Cambridgeshire, the gym is a 15 minute drive from Huntingdon or St Neots or a 20 minute drive from Kimbolton or St Ives. Unlike city centre gyms there’s no gym bunnies or hulk-like characters in our space. It’s much more of a community of like-minded people who want to do fitness well. We won’t put you on a treadmill and let you run for 30 minutes. We make the most of free weights, bootcamp style exercises in the paddock and boxing equipment to help you tone, train and improve. There’s also a cafe with outdoor seating overlooking the marina, should you decide to take a little time for yourself before your session. Other than aches, pains and some extra fat? If you are curious about Personal Training then book a no obligation trial session today. Following a chat about you, your diet, exercise levels and the reasons you want a personal trainer, we’ll pop in to the gym and carry out a trial session. If you enjoy your trial you can book more sessions, and if not there’s no hard feelings.